Gold, originally uploaded by danny angus. I Went to see Culture at the Arches on Friday night with a friend/colleague who shall be referred to only as Jonny. Don't expect too much from this post though, I'm not your personal gig reviewer, but I can tell you the atmosphere was great, the band were great, Kenyatta Hill was great, (replacing his father Joseph, who sadly passed away last year) and a fun time was had by all. The things that made it a bit weird were that the audience was 90% middle-aged white people, and that the view of the band was unobstructed by smoke (see pic), what with Scotland having a ban on smoking in enclosed public places. Undeterred, however, some members of the audience did manage, surreptitiously, to create the right "atmosphere". 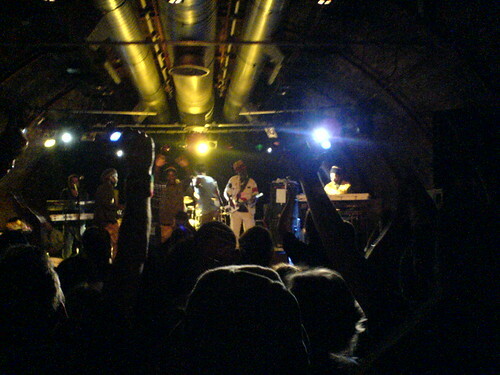 All in all the whole evening was enough to convert anyone to Rastafarianism, apart possibly from the wee guy from Edinburgh who, when Kenyatta said "When we return to Africa", was overheard saying, worriedly, to his lady companion "I don't wanny go tae Africa".